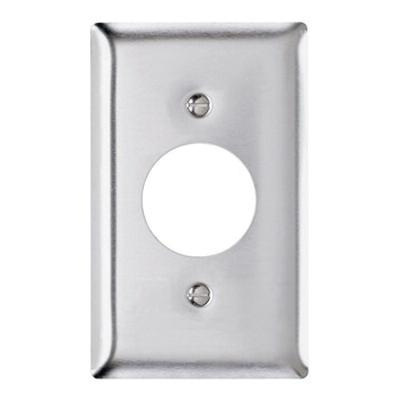 Pass & Seymour Standard size 1-Gang rectangle wallplate has 302/304 stainless steel construction and brushed finish. This alloy contains 18% chromium and 8% nickel to ensure better resistance to corrosion. It measures 4.5-Inch x 2.75-Inch. This wallplate has one single receptacle configuration. It is suitable for use in food processing plants, dairies, chemical plants, other industrial, institutional and commercial applications. This wallplate has vertical orientation and is screw mountable.